RFID - Radio Frequency Identification. This is a technique which uses a radio signal to communicate with a small tag, and, by extension, the item to which that tag is attached. Originally developed by the military to distinguish between friendly and hostile aircraft, it is now commonly used to refer to the tags used to identify a wide variety of items. These are commonly small items, goods in transit, fixed assets or file folders, but use can extend up to larger items, vehicles and agricultural or construction machinery. RFID tags can be grouped by two characteristics, by whether they are active or passive and by their operating frequency. The distinction is the source of the power for the signal transmitted by the tag. Passive tags have no internal energy source. They collect energy from the reader, and remain dormant when not energised by the reader. 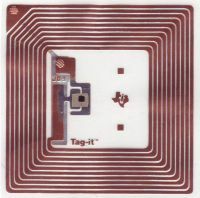 Active RFID tags have an internal battery. They transmit continuously to a passive reader, which picks up and processes the transmitted signal. Passive tags have an antennae or receiving coil, which collects and stores energy transmitted by the reader. The tag then emits a short burst of energy, encoded with the critical information it is communicating. Passive tags only transmit when they have been energised by a reader. Passive tags tend to be cheaper and smaller, and their life is only limited by the reliability of their components. They can be expected to function for decades. The range at which the tags can be read depends on their frequency of operation, and the power of the reader. Range can vary from less than a centimeter to several meters. The ability to read a tag is affected greatly by the reader. Readers can be fixed, or integrated with a portable handheld computer. In mobile applications some readers are still relatively bulky and large, with the transmitting and receiving antennae being three or four inches high and just as wide. Others are smaller, sometimes with a reduced read range as a consequence. Antennae types - circular or linear. The two different formats of antenna result in different reading capabilities. The linear antenna can give a longer read range, but requires a specific alignment for the tag to be read. If the reader is held "on its side", then range is dramatically diminished. For a circular antenna, the orientation of the reader with respect to the tag does not affect read range. As an example, a typical mobile circular antennae may have a read range of six feet, regardless of orientation, compared to a similar linear reader, which might have a read range of twelve feet when properly aligned, but only twelve inches when either the tag or the reader is rotated (on the axis joining the items) through ninety degrees. Tags can today be broken down by frequency into three categories. Tags for each of these three frequency ranges were developed sequentially. In the same way that music formats have moved from vinyl to cassette to CD, so RFID tag technology has moved from LF to HF to UHF. Each has specific benefits and drawbacks, and choosing the "best" tag depends very much on the application. Low Frequency tags operate in the range 125 KHz. These were the first tags to be developed, and are frequently used in animal tracking. Their physical design requires many turns of conductor to capture enough energy to respond. This tends to make them thicker, and more expensive to manufacture. Range is of the order of an inch or so. Format can be cylindrical - think of one inch cut from the end of a drinking straw, or bobbin shaped - think of several large coins in a pile. High Frequency RFID tags operate in the range 10-15 MHz. These are frequently used for access controls. You may see them at your local gas pump. Less turns of conductor are required, typically fewer than twenty, so these tags are often manufactured using the same techniques that were developed for printing wiring boards. A typical design is shown above. These tags are thinner, but typically occupy a similar surface area to a credit card, though smaller button versions are available. Read range is typically up to twelve inches. Applications include shelf readers - which can give you a real time view of your inventory. HF tags are also available as encapsulated buttons, which can be sewn into the hem of a garment. These buttons can survive the rigours of a laundry, and are often used to track uniforms. Ultra High Frequency tags operate in two bands, around 900 MHz and 2.4 GHz. These are the most recently developed tags, and are used in unit tracking and the supply chain applications. At these frequencies, the wavelength of the transmitted signal is much shorter, so the tags use a simple antennae, and there is no longer a need for coils with multiple turns. This makes the design much simpler, though the antennae still needs to be a few inches long to give a reasonable read reliability. Often, also, the tags are encapsulated, and may be artificially thick, to enable the tag to be mounted on a metal surface. In this case the actual tag mechanism is stood off from the metal by the thickness of the tag. Read ranges can be up to twenty feet of more, but the tags are more affected by metal or liquid. Placing your hand over a tag can reduce its readability. These tags often have the ability to store information, typically to identify a specific item by using codes to identify company, model, and serial number. Applications include supply chain and asset management. Most LF tags are used as read only items. They are manufactured with a fixed identity, and the reading system uses that ID, either directly, for data collection, or as a key to information stored in a database. HF and UHF tags can generally be written to. The volume of data changes from tag to tag. Write range is typically half or less the read range. First, and most important, are you sure you have to? "Just because you can" is not a good reason. In most cases, data is best stored in the central database. Second, and perhaps most important, you have to be sure you know which tag you are writing to. Without careful thought, you can end up writing to the wrong tag. When we review clients system designs, we often find these two flaws. Contact SageData for more information on writing to tags. Active tags get their power from a small internal battery. They can be read at greater distances, but they tend to be slightly larger and more expensive. The life of an active tag is limited by the life of the battery, which generally cannot be replaced. The life of an active tag is of the order of several years, though this can be modified as the tag is set up, with speed of response being traded for battery life. Active tags are often transmit only. From the time of manufacture, until the battery expires, these tags regularly transmit a small message which uniquely identifies them. They do this whether in range of a reader or not. A typical cycle would be once per second. There is a trade off between speed of response and battery life, but even with one burst of transmission per second, several years of battery life can be expected. Most basic active RFID tags are read only. Most do not even have a receiving circuit. They have an identity which is set during manufacture, and that cannot be changed. More advanced RFID tags have many additional functions, including read / write capability and data storage. Follow this link to see how active and passive RFID tags and readers can be applied to real-world applications. For further information, or for advice and assistance with your application, contact Doreen Wallace or Frances Minhas.